This simple craft is absolutely adorable and lots of fun to make. It is great for younger children who are relatively new to crafts because most of the pieces are large and simple to cut out. Kids can let their creative side show by printing out the B&W template and making their triceratops a fun colour! Plus, they can use this craft as a cute decoration or attach a popsicle stick to the bottom and create a fun character to play with! 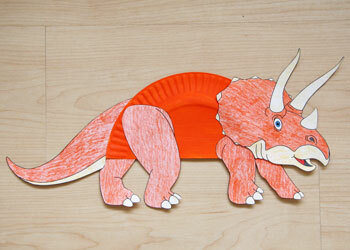 Print out the triceratops craft templates you would prefer to use. Color (if using the black and white version of the craft) and cut out the template pieces. Most of the pieces are large, simple shapes (like the tail) which are easy for young children to cut out, but if needed, an adult can help with some of the harder pieces (for example, the head). 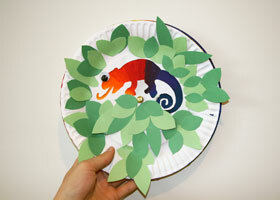 Cut a paper plate in half and paint the bottom of it whichever colour you would like. Glue the front leg 2 and back leg 2 to the inside (unpainted side) of the paper plate (this way they will look hidden by the triceratops' body). 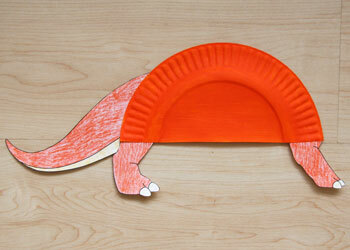 Glue the tail to the inside of the paper plate as well. Glue the front leg 1 and the back leg 1 to the painted side of the paper plate. Glue the head to the front side of the triceratops' body. Optional: If If you want to play with the triceratops as a puppet or character you can tape a popsicle stick or tongue depressor to the middle of the body (paper plate).